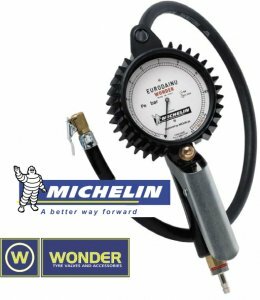 The Wonder Eurodainu tyre inflator features a large easy to read dial scale protected by a rubber cover. It is licensed and approved by Michelin. The design permits a high airflow rate saving time time when inflating large tyres. This model has a 1.5m connection hose and a single clip-on tyre valve connector with a range of 10-160psi. All Schrader tyre inflation gauges conform to EC regulations for calibration and accuracy.